"War dogs" redirects here. For other uses, see Dogs of War and War Dogs. 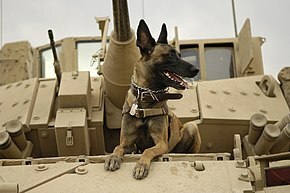 A United States Air Force Belgian Malinois on a M2A3 Bradley Fighting Vehicle before heading out on a mission in Kahn Bani Sahd, Iraq, Feb. 13, 2007. Dogs in warfare have a long history starting in ancient times. From war dogs trained in combat to their use as scouts, sentries and trackers, their uses have been varied and some continue to exist in modern military usage. War dogs were used by the Egyptians, Greeks, Persians, Sarmatians, Baganda, Alans, Slavs, Britons, and the Romans. The Molossus dog of the Molossia region of Epirus was the strongest known to the Romans, and was specifically trained for battle. Among the Greeks and Romans, dogs served most often as sentries or patrols, though they were sometimes taken into battle. The earliest use of war dogs in a battle recorded in classical sources was by Alyattes of Lydia against the Cimmerians around 600 BC. The Lydian dogs killed some invaders and routed others. During the Late Antiquity, Attila the Hun used molosser dogs in his campaigns. Gifts of war dog breeding stock between European royalty were seen as suitable tokens for exchange throughout the Middle Ages. Other civilizations used armored dogs to defend caravans or attack enemies. In the Far East, Emperor Lê Lợi raised a pack of 100 hounds, this pack was tended and trained by Nguyễn Xí whose skills were impressive enough to promote him to the Commander of a shock troop regiment. Later on, Frederick the Great used dogs as messengers during the Seven Years' War with Russia. Napoleon also used dogs during his campaigns. Dogs were used up until 1770 to guard naval installations in France. The first official use of dogs for military purposes in the United States was during the Seminole Wars. Hounds were used in the American Civil War to protect, send messages, and guard prisoners. General Grant recounts how packs of southern bloodhounds were destroyed by Union troops wherever found due to their being trained to hunt men. Dogs were also used as mascots in American World War I propaganda and recruiting posters. Dogs have been used in warfare by many civilizations. As warfare has progressed, their purposes have changed greatly. Mid-7th century BC: In the war waged by the Ephesians against Magnesia on the Maeander, the Magnesian horsemen were each accompanied by a war dog and a spear-bearing attendant. The dogs were released first and broke the enemy ranks, followed by an assault of spears, then a cavalry charge. An epitaph records the burial of a Magnesian horseman named Hippaemon with his dog Lethargos, his horse, and his spearman. 525 BC: At the Battle of Pelusium, Cambyses II uses a psychological tactic against the Egyptians, arraying dogs and other animals in the front line to effectively take advantage of the Egyptian religious reverence for animals. 490 BC: At the Battle of Marathon, a dog follows his hoplite master into battle against the Persians and is memorialized in a mural. 480 BC: Xerxes I of Persia is accompanied by vast packs of Indian hounds when he invades Greece. They may have served in the military as well as being used for sport or hunting, but their purpose is unrecorded. 281 BC: Lysimachus is slain during the Battle of Corupedium and his body was discovered preserved on the battlefield and guarded vigilantly by his faithful dog. 231 BC: the Roman consul Marcus Pomponius Matho, leading the Roman legions through the inland of Sardinia, where the inhabitants led guerrilla warfare against the invaders, used "dogs from Italy" to hunt out the natives who tried to hide in the caves. 120 BC: Bituito, king of the Arvernii, attacked a small force of Romans led by the consul Fabius, using just the dogs he had in his army. 1500s: Mastiffs and other large breeds were used extensively by Spanish conquistadors against Native Americans. 1914–1918: Dogs were used by international forces to deliver vital messages. About a million dogs were killed in action. Sergeant Stubby, a Bull Terrier or Boston Terrier, has been called the most decorated war dog of World War I, and the only dog to be nominated for rank and then promoted to sergeant through combat, a claim having no official documentary evidence, but recognized in connection with an exhibition at the Smithsonian Institution. Among other exploits, he is said to have captured a German spy. He was also a mascot at Georgetown University. Rags was another notable World War I dog. 1941–1945: The Soviet Union deployed dogs strapped with explosives against invading German tanks, with limited success. 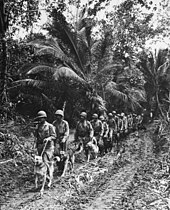 1943–1945: The United States Marine Corps used dogs, donated by their American owners, in the Pacific theater to help take islands back from Japanese occupying forces. During this period the Doberman Pinscher became the official dog of the USMC; however, all breeds of dogs were eligible to train to be "war dogs of the Pacific". Of the 549 dogs that returned from the war, only 4 could not be returned to civilian life. Many of the dogs went home with their handlers from the war. Chips was the most decorated war dog during World War II. 1966–1973: Approximately 5,000 US war dogs served in the Vietnam War (the US Army did not retain records prior to 1968); about 10,000 US servicemen served as dog-handlers during the war, and the K9 units are estimated to have saved over 10,000 human lives. 232 military working dogs and 295 US servicemen working as dog handlers were killed in action during the war. It is estimated that about 200 Vietnam War dogs survived the war to be assigned at other US bases outside the US. The remaining canines were euthanized or left behind. 2011: United States Navy SEALs used a Belgian Malinois military working dog named Cairo in Operation Neptune Spear, in which Osama bin Laden was killed. U.S. Army SP4 Bealock and German Shepherd scout dog "Chief" on patrol in Vietnam. Dogs have been used for many different purposes. Different breeds were used for different things, but always met the demands of the handlers. Many roles for dogs in war are obsolete and no longer practiced, but the concept of the war dog still remains alive and well in modern warfare. Military working dog wearing body armor, undergoing escalation of force training in Afghanistan. In ancient times, dogs, often large mastiff- or molosser-type breeds, would be strapped with armor or spiked collars and sent into battle to attack the enemy. This strategy was used by various civilizations, such as the Romans and the Greeks. 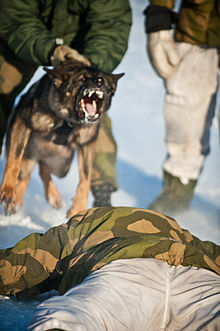 While not as common as in previous centuries, modern militaries continue to employ dogs in an attack role. 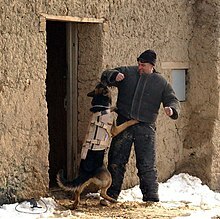 SOCOM forces of the US military still use dogs in raids for apprehending fleeing enemies or prisoners, or for searching areas too difficult or dangerous for human soldiers (such as crawl spaces). Another program attempted during World War II was suggested by a Swiss citizen living in Santa Fe, New Mexico. William A. Prestre proposed using large dogs to kill Japanese soldiers. He convinced the military to lease an entire island in the Mississippi to house the training facilities. There the army hoped to train as many as two million dogs. The idea was to begin island invasions with landing craft releasing thousands of dogs against the Japanese defenders, then followed up by troops as the Japanese defenders scattered in confusion. One of the biggest problems encountered was getting Japanese soldiers to train the dogs with, because few Japanese soldiers were being captured. Eventually, Japanese-American soldiers volunteered for the training. Another large problem was with the dogs; either they were too docile, did not properly respond to their beach crossing training, or were terrified by shellfire. After millions of dollars were spent with inconclusive results, the program was abandoned. The Soviet Union used dogs for anti-tank purposes beginning in the 1930s. Earlier anti-tank dogs were fitted with tilt-rod mines and trained to run beneath enemy tanks, which would detonate the mines automatically. However, the dogs were trained with stationary Russian tanks and very seldom ran under the moving tanks, instead they were shot as they ran beside the moving tanks. When both Russian and German tanks were present, the dogs would preferentially run towards the familiar Russian tanks. About the time World War I broke out, many European communities used dogs to pull small carts for milk deliveries and similar purposes. Several European armies adapted the process for military use. 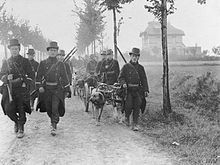 In August 1914, the Belgian Army used dogs to pull their Maxim Guns on wheeled carriages and supplies or reportedly even wounded in their carts. The use of dogs for this purpose ceased with the advent of trench warfare after the first two months of the conflict. The French had 250 dogs at the start of World War I. The Dutch army copied the idea and had hundreds of dogs trained and ready by the end of World War I (the Netherlands remained neutral). The Soviet Red Army also used dogs to drag wounded men to aid stations during World War II. The dogs were well-suited to transporting loads over snow and through craters. Dogs were often used to carry messages in battle. They would be turned loose to move silently to a second handler. This required a dog that was very loyal to two masters, otherwise the dog would not deliver the message on time or at all. Some messenger dogs also performed other communication jobs, such as pulling telephone lines from one location to another. A Famous Yorkshire terrier (4 lb) named Smoky was used to run a telegraph wire through a 4-8 inch diameter, 70 ft long pipe to ensure communication without moving troops into the line of fire. Dogs were often used as unit mascots for military units. The dog in question might be an officer's dog, an animal that the unit chose to adopt, or one of their canines employed in another role as a working dog. Some naval dogs such as Sinbad and Judy were themselves enlisted service members. 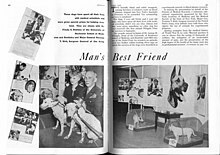 Some units also chose to employ a particular breed of dog as their standard mascot, with new dogs replacing the old when it died or was retired. The presence of a mascot was designed to uplift morale, and many were used to this effect in the trenches of World War I. An example of this would be Sgt. Stubby for the US Army. Medical researchers, and their allies in the armed forces, awarded military-style medals to animals in laboratories to emphasize the martial significance of animal experimentation. Here, Army Surgeon General Major General Norman T. Kirk, on behalf of the Friends of Medical Research, bestows medals upon research dogs Trixie and Josie "for outstanding services to humanity." In World War II, dogs took on a new role in medical experimentation, as the primary animals chosen for medical research. The animal experimentation allowed doctors to test new medicine without risking human lives, though these practices came under more scrutiny after the war. The United States' government responded by proclaiming these dogs as heroes. The Cold War sparked a heated debate over the ethics of animal experimentation in the U.S., particularly aimed at how canines were treated in World War II. In 1966, major reforms came to this field with the adoption of the Laboratory Animal Welfare Act. Many dogs were used to locate mines. They did not prove to be very effective under combat conditions. Marine mine detecting dogs were trained using bare electric wires beneath the ground surface. The wires shocked the dogs, teaching them that danger lurked under the dirt. Once the dog's focus was properly directed, dummy mines were planted and the dogs were trained to signal their presence. While the dogs effectively found the mines, the task proved so stressful for the dogs they were only able to work between 20 and 30 minutes at a time. The mine detecting war dogs anticipated random shocks from the heretofore friendly earth, making them extremely nervous. [clarification needed] The useful service life of the dogs was not long. Experiments with lab rats show that this trend can be very extreme, in some tests rats even huddled in the corner to the point of starvation to avoid electric shock. Dogs have historically also been used in many cases to track fugitives and enemy troops, overlapping partly into the duties of a scout dog, but use their olfactory skill in tracking a scent, rather than warning a handler at the initial presentation of a scent. SCOUT DOG by Augustine G. Acuna, Vietnam Combat Artists Program, CAT II, 1966-67. Image courtesy of National Museum of the U. S. Army. 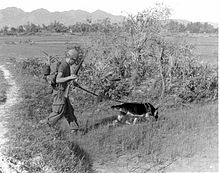 Scout dogs were used in World War II, Korea, and Vietnam by the United States to detect ambushes, weapon caches, or enemy fighters hiding underwater, with only reed breathing straws showing above the waterline. The US operated a number of scout dog platoons (assigned on a handler-and-dog team basis to individual patrols) and had a dedicated dog training school in Fort Benning, Georgia. One of the earliest military-related uses, sentry dogs were used to defend camps or other priority areas at night and sometimes during the day. They would bark or growl to alert guards of a stranger's presence. During the Cold War, the American military used sentry dog teams outside of nuclear weapons storage areas. A test program was conducted in Vietnam to test sentry dogs, launched two days after a successful Vietcong attack on Da Nang Air Base (July 1, 1965). Forty dog teams were deployed to Vietnam for a four-month test period, with teams placed on the perimeter in front of machine gun towers/bunkers. The detection of intruders resulted in a rapid deployment of reinforcements. The test was successful, so the handlers returned to the US while the dogs were reassigned to new handlers. The Air Force immediately started to ship dog teams to all the bases in Vietnam and Thailand. U.S. Army military working dog searches among rubble and trash outside a target building in Rusafa, eastern Baghdad, Iraq. Contemporary dogs in military roles are also often referred to as police dogs, or in the United States and United Kingdom as a Military Working Dog (MWD), or K-9. Their roles are nearly as varied as those of their ancient cousins, though they tend to be more rarely used in front-line formations. As of 2011, 600 U.S. Military dogs were actively participating in the conflicts in Iraq and Afghanistan. Traditionally, the most common breed for these police-type operations has been the German Shepherd; in recent years there has been a shift to smaller dogs with keener senses of smell for detection work, and more resilient breeds such as the Belgian Malinois and Dutch Shepherd for patrolling and law enforcement. All MWDs in use today are paired with a single individual after their training. This person is called a handler. While a handler usually won't stay with one dog for the length of either's career, usually a handler will stay partnered with a dog for at least a year, and sometimes much longer. The latest canine tactical vests are outfitted with cameras and durable microphones that allow dogs to relay audio and visual information to their handlers. In the 1970s the US Air Force used over 1,600 dogs worldwide. Today, personnel cutbacks have reduced USAF dog teams to approximately 530, stationed throughout the world. Many dogs that operate in these roles are trained at Lackland Air Force Base, the only United States facility that currently trains dogs for military use. Change has also come in legislation for the benefit of the canines. Prior to 2000, older war dogs were required to be euthanized. The new law permits adoption of retired military dogs. One notable case of which was Lex, a working dog whose handler was killed in Iraq. There are numerous memorials dedicated to war dogs, including March Field Air Museum in Riverside, California; the Infantry School at Fort Benning, Georgia; at the Naval Facility, Guam, with replicas at the University of Tennessee College of Veterinary Medicine in Knoxville; the Alfred M. Gray Marine Corps Research Center in Quantico, Virginia; and the Alabama War Dogs Memorial at the USS Alabama Battleship Memorial Park in Mobile, Alabama. A dog inspects baggage for loading aboard a HMX-1 aircraft. As a partner in everyday military police work, dogs have proven versatile and loyal officers. Police dogs can chase suspects, track them if they are hidden, and guard them when they are caught. They are trained to respond viciously if their handler is attacked, and otherwise not to react at all unless they are commanded to do so by their handler. Many police dogs are also trained in detection as well. Both MWDs and their civilian counterparts provide service in drug detection, sniffing out a broad range of psychoactive substances despite efforts at concealment. Provided they have been trained to detect it, MWDs can smell small traces of nearly any substance, even if it is in a sealed container. Dogs trained in drug detection are normally used at ports of embarkation such as airports, checkpoints, and other places where there is high security and a need for anti-contraband measures. MWDs can also be trained to detect explosives. As with narcotics, trained MWDs can detect minuscule amounts of a wide range of explosives, making them useful for searching entry points, patrolling within secure installations, and at checkpoints. These dogs are capable of achieving over a 98% success rate in bomb detection. The use of Military Working Dogs on prisoners by the United States during recent wars in Afghanistan and Iraq has been controversial. Iraq War: The United States has used dogs to intimidate prisoners in Iraqi prisons. In court testimony following the revelations of Abu Ghraib prisoner abuse, it was stated that Col. Thomas M. Pappas approved the use of dogs for interrogations. Pvt. Ivan L. Frederick testified that interrogators were authorized to use dogs and that a civilian contract interrogator left him lists of the cells he wanted dog handlers to visit. "They were allowed to use them to ... intimidate inmates", Frederick stated. Two soldiers, Sgt. Santos A. Cardona and Sgt. Michael J. Smith, were then charged with maltreatment of detainees, for allegedly encouraging and permitting unmuzzled working dogs to threaten and attack them. Prosecutors have focused on an incident caught in published photographs, when the two men allegedly cornered a naked detainee and allowed the dogs to bite him on each thigh as he cowered in fear. 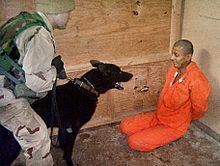 Guantanamo Bay: It is believed that the use of dogs to intimidate prisoners in Iraq was learned from practices at Guantanamo Bay Naval Base. The use of dogs on prisoners by regular U.S. forces in Guantanamo Bay Naval Base was prohibited by Donald Rumsfeld in April 2003. A few months later following revelations of abuses at Abu Ghraib prison, including use of dogs to terrify naked prisoners; Rumsfeld then issued a further order prohibiting their use by the regular U.S. forces in Iraq. Traditionally, as in World War II, US military working dogs (war dogs) were returned home after the war; to their former owners or new adopted ones. The Vietnam War was different in that US war dogs were designated as expendable equipment and were either euthanized or turned over to an allied army prior to the US departure from South Vietnam. Due to lobbying efforts by veteran dog handlers from the Vietnam War Congress approved a bill allowing veteran US military working dogs to be adopted after their military service. In 2000, President Bill Clinton signed a law that allowed these dogs to be adopted, making the Vietnam War the only American war in which US war dogs never came home. Military working dogs continue to serve as sentries, trackers, search and rescue, scouts, and mascots. Retired working dogs are often adopted as pets or therapy dogs. A U.S. Air Force Security Forces dog handler attached to the Army's 3rd Special Forces Group in Afghanistan with a German Shepherd. Megan Leavey (film), tells the true story of US Marine corporal Megan Leavey and her military working dog Rex. Lewis, Damien (2013). War Dog: The No-Man's Land Puppy Who Took To the Skies. London: Sphere. ISBN 978-0751552751. Richardson, Anthony (1961). One Man and His Dog. New York: Dutton. ISBN 978-1844155903. Ross, Hamish (2007). Freedom in the Air: A Czech Flyer and His Aircrew Dog. Pen & Sword Aviation. ISBN 978-1844155903. Dickin Medal, UK honour awarded to animals "for gallantry"
^ a b c Newton, Tom. "K-9 History: The Dogs of War!". Hahn's 50th AP K-9. Retrieved 2008-11-25. ^ a b "Dogs of War in European Conflict; Egyptians and Romans Employed Them in Early Warfare — Battle Dogs in 4000 B.C". The New York Times. February 21, 1915. p. S3. Retrieved 2008-11-26. ^ Morral, Timothy. "History of the Pit Bull". Pitbull411.com. Retrieved November 26, 2008. ^ E.S. Forster, "Dogs In Ancient Warfare," Greece & Rome 10 (1941) 114–117. ^ Polyaenus, Stratagems 7.2; Forster, "Dogs in Ancient Warfare," p. 114. ^ Nguyễn, Thanh Điệp (11 March 2017). "Tướng Việt được ví như Khổng Minh, lấy hàng vạn tên của giặc". Zing.vn. ^ Frankel, Rebecca (2014). War Dogs. New York, New York: PALGRAVE MACMILLAN TRADE. ^ Todaro, Giovanni (2011). I cani in guerra. Da Tutankhamon a Bin Laden (in Italian). Oasi Alberto Perdisa. ISBN 978-88-8372-513-5. ^ Aelian, Varia Historia 14.46; Forster, "Dogs in Ancient Warfare," p. 115. ^ P.A.L. Greenhalgh, Early Greek Warfare: Horsemen and Chariots in the Homeric and Archaic Ages (Cambridge University Press, 1973, 2010), p. 145. ^ Polyaenus, Stratagems 7.9; Forster, "Dogs in Ancient Warfare," p. 114. ^ Aelian, On the Nature of Animals 7.38. ^ Herodotus, Histories 7.187; Forster, "Dogs in Ancient Warfare," p. 115. ^ Williams, Henry Smith. Historians History of the World (Volume 4), p. 505. ^ Zonara,'Epitomé historíon' VIII 19 P. I 401; E. Pais, 'Storia della Sardegna e della Corsica durante il periodo romano' I, 154 (in 'Bibliotheca Sarda' n. 42). ^ Orosius, 'Historiarum adversos paganos', V, 14. ^ "9 Million Unsung Heroes WW1, Daily Mirror, July, 2014". Mirror.co.uk. 2014-07-31. Retrieved 2018-05-21. ^ "Evening Public Ledger. (Philadelphia [Pa.]) 1914-1942, July 09, 1921, NIGHT EXTRA, Image 18". Chroniclingamerica.loc.gov. Philadelphia, Pennsylvania. Library of Congress. July 9, 1921. Archived from the original on March 4, 2016. Retrieved February 6, 2016. ^ a b c ""The Price of Freedom" exhibition". Smithsonian Institution. Archived from the original on June 24, 2014. Retrieved July 14, 2014. 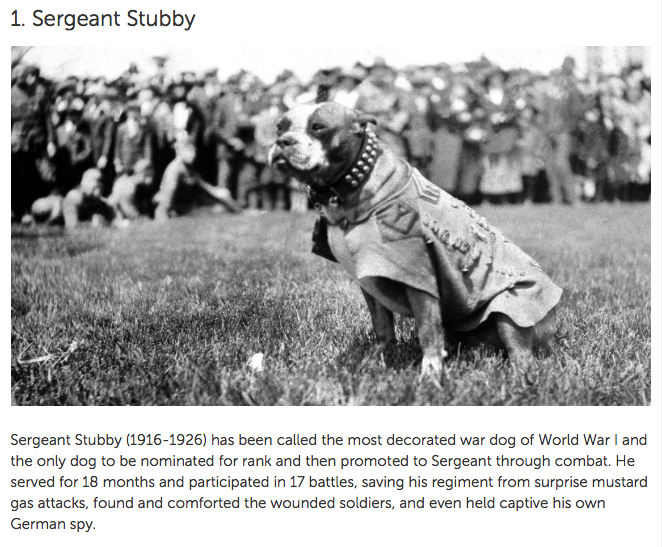 ^ "Stubby, World War I Canine Hero 1921". History wired. Smithsonian Institution. Archived from the original on November 17, 2014. Retrieved July 15, 2014. ^ Kane, Gillian; Larson-Walker, Lisa, Illustrator (May 7, 2014). "Sergeant Stubby: America's original dog of war fought bravely on the Western Front—then helped the nation forget the Great War's terrible human toll". Slate.com. Archived from the original on July 13, 2014. Retrieved July 13, 2014. Reprinted in Kane, Gillian (May 24, 2014). "The story of Sergeant Stubby, WWI's most decorated dog". Stars & Stripes. Archived from the original on July 1, 2014. Retrieved July 17, 2014. ^ "Marine Dogs of World War II". Worldwar2history.info. 1944-08-10. Retrieved 2018-05-21. ^ Jessica Ravitz. "CNN special report". Cnn.com. Retrieved 2018-05-21. ^ Viegas, Jennifer (2 May 2011). "A U.S. Navy Seals' Secret Weapon: Elite Dog Team". Discovery.com. Retrieved 5 May 2011. ^ Brammer, Jack; Steven Thomma (7 May 2011). "Obama thanks special forces for daring bin Laden raid". Seattle Times. Archived from the original on 18 September 2011. Retrieved 7 May 2011. ^ "Training for US SOCOM's Best Friends". Defenseindustrydaily.com. 2011-06-13. Retrieved 2018-05-21. ^ Winston Groom (2005). 1942: The Year that Tried Men's Souls. Atlanta Monthly Press. pp. 166–168. ISBN 0-87113-889-1. ^ Ouida (1872). A Dog of Flanders. Chapman & Hall. ^ Dyer, Walter A. (2006). Pierrot the Carabinier: Dog of Belgium. Diggory Press. ISBN 978-1-84685-036-3. ^ Willmott, H.P. (2003). First World War. Dorling Kindersley. p. 59. ^ "World War Two Combat: Axis and Allies". Hahn's 50th AP K-9. ^ a b "Canine Heroes and Medals". History of Medicine: Animals as Cold Warriors. National Library of Medicine, NIH. October 24, 2006. Retrieved 2008-07-08. ^ Buettinger, Craig (January 1, 1993). "Antivivisection and the charge of zoophil-psychosis in the early twentieth century". The Historian. Retrieved 2008-07-08. ^ a b Rubenstein, SP4 Wain (June 1969). "Scout Dogs - Enemy's Worst Enemy..." Danger Forward. U.S/ Army Quartermaster Museum. 3 (2). Archived from the original on 2009-08-03. ^ "Types of War Dogs - US War Dog Association - National Headquarters". www.uswardogs.org. Retrieved 16 June 2016. ^ "War Dogs". Fort Lee, Virginia: U.S. Army Quartermaster Museum. January 9, 2007. Archived from the original on May 23, 2008. Retrieved 2008-07-08. ^ Gardiner Harris (4 May 2011). "A Bin Laden Hunter on Four Legs". The New York Times Company. Retrieved 5 May 2011. There are 600 dogs serving in Afghanistan and Iraq, and that number is expected to grow substantially over the next year. ^ a b Mott, Maryann (April 9, 2003). "Dogs of War: Inside the U.S. Military's Canine Corps". National Geographic News. Retrieved 2008-07-08. ^ "War Dog Memorial". The University of Tennessee. ^ Simpson, Tara K. (September 22, 2007). "War Dog Memorial Tells Little-Known Tale". Stars and Stripes. Archived from the original on August 4, 2009. Retrieved July 23, 2010. ^ "War Dogs". U.S. Army Quartermaster Museum. Archived from the original on 2008-05-23. Retrieved 2008-07-08. ^ Goodman, Amy (August 29, 2007). "Gonzales' tortured legacy lingers". Seattle Post Intelligencer. ^ a b White, Josh (July 26, 2005). "Abu Ghraib Dog Tactics Came From Guantanamo". The Washington Post. p. A14. ^ Diamond, John (July 19, 2004). "Top commanders in Iraq allowed dogs to be used". USA Today. ^ Watson, Julie (May 27, 2011). "Demand for adopting retired military dogs soars after SEAL raid". The Star. Toronto. ^ "War Dog: A Soldier's Best Friend". HBO. Home Box Office, Inc. Retrieved 15 January 2018. ^ Kit, Borys (October 22, 2015). "'Harry Potter' Actor Tom Felton Joins Kate Mara in Indie War Hero Drama (Exclusive)". The Hollywood Reporter. Retrieved October 22, 2015. ^ McNary, Dave (January 11, 2017). "Kate Mara Iraq War Hero Biopic 'Megan Leavey' Gets Release Date". Variety magazine. Retrieved January 11, 2017. Dyer, Walter A. (2006). Pierrot the Carabinier: Dog of Belgium. Meadow Books. ISBN 1-84685-036-3. Richardson, E.H. (1920). British War Dogs; their training and psychology. London: Skeffington. Rohan, Jack (2006). Rags, The Dog Who Went to War. Liskeard: Diggory Press. ISBN 978-1-84685-364-7. OCLC 1348025. Varner, John; J.J. Varner (1983). Dogs of the Conquest. Norman, OK: University of Oklahoma Press. ISBN 978-0806117935. Whitridge-Smith, Bertha (2006). Only A Dog: The True Story of a Dog's Devotion to His Master During World War. Lightning Source. ISBN 978-1-84685-365-4. Wood, E. S.; R. M. Franklin (2005). Captain Loxley's Little Dog And Lassie The Life-saving Collie: Hero Dogs of the First World War Associated With The Sinking of H.M.S. Formidable. Burgress Hill: Diggory Press. ISBN 978-1-905363-13-1. OCLC 62306949. Burnam, John C. (2006). Dog Tags of Courage: Combat Infantrymen and War Dog Heroes in Vietnam. Lost Coast Press. ISBN 978-1-882897-88-9. Burnam, John C. (2008). A Soldier's Best Friend; Scout Dogs and their Handlers in the Vietnam War. Sterling Publishing. ISBN 978-1-4027-5447-0. Dowling, Mike C. (2011). Sergeant Rex: the unbreakable bond between a Marine and his military working dog. Atria Books. ISBN 9781451635966. Michael, Ritland; Gary Brozek (2013). Trident K9 Warriors: my tales from the training ground to the battlefield with elite Navy SEAL canines. St. Martin's Press. ISBN 9781250024978. Wikimedia Commons has media related to Military working dogs. Born, K. M (January 8, 2007). "Quartermaster Dog Training Program". Fort Lee, Virginia: U.S. Army Quartermaster Museum. Archived from the original on 2013-01-20. Donn, Jeff (August 12, 2007). "Dogs in war receive loyalty, top care". Army Times. Associated Press. "K-9 History: The Dogs of War!" (not an official military site). Hahn Air Base, West Germany: 50th Air Police K-9 Section. "Military Working Dog Teams National Monument". Pitts, 2ndLt. Mike (1966). "U.S. war dogs remembered". K-9 Heroes - Remembered. The United States War Dogs Association. "Vietnam Security Police Association K-9 pages". "War Dogs". Fort Lee, Virginia: U.S. Army Quartermaster Museum. January 9, 2007. Archived from the original on May 23, 2008. "War dogs, military service dogs, battle dogs". The Bulldog Information Library. "War Dogs: Reference Bibliography". Fort Lee, Virginia: U.S. Army Quartermaster Museum. Archived from the original on 2007-10-08. "Military Working Dog Public Domain Images Collection". "Alabama War Dogs Memorial Foundation". "Dogs of the American Civil War: A Tribute". This page was last edited on 17 April 2019, at 10:36 (UTC).